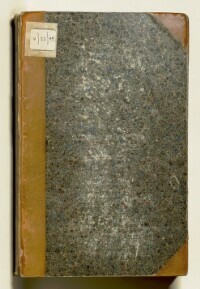 The record is made up of 1 volume (57 folios). It was created in 1886. It was written in English. The original is part of the British Library: India Office The department of the British Government to which the Government of India reported between 1858 and 1947. The successor to the Court of Directors. Records and Private Papers. 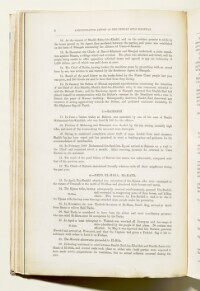 Part 1 ( General Summary, folios 47-54), containing summaries of local political affairs, and incidents or events of particular note for: the ‘Pirate coast of Oman’; Bahrain (spelt as Bahrein throughout); Nejd, El-Hasa [Al-Hasa] and El-Katr [Qatar]; Fars, including Bushire, Lingah [Bandar-e Lengeh], Bassidore (mistakenly spelt Rassidore in the heading), and Bunder Abbass [Bandar-e ʻAbbās]; Persian Arabistan; and Persian Baluchistan. 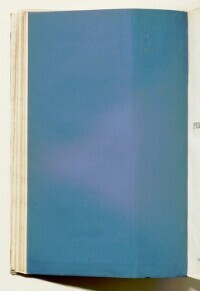 The report also records a marked increase in the slave trade to the Gulf from Africa, due to the departure of HMS London from Zanzibar; summaries of changes in official personnel; British naval movements in the Gulf; and a summary of meteorological events observed at the Bushire observatory, including a severe gale which caused extensive damage to ports and towns throughout the Gulf. Appendix A contains tabulated and graphical meteorological data for the year, supplied by the Bushire observatory. 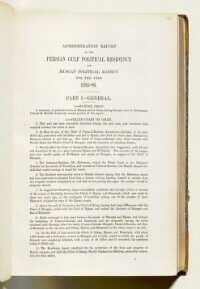 Appendix B is a report entitled ‘A résumé of what has been done in the Persian Gulf Historically used by the British to refer to the sea area between the Arabian Peninsula and Iran. Often referred to as The Gulf or the Arabian Gulf. 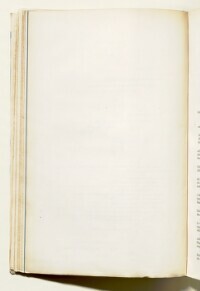 as regards to the introduction of the Arabian date-palm in India’ written by A. R. Hakim, Assistant to the Political Resident A senior ranking political representative (equivalent to a Consul General) from the diplomatic corps of the Government of India or one of its subordinate provincial governments, in charge of a Political Residency. in the Persian Gulf Historically used by the British to refer to the sea area between the Arabian Peninsula and Iran. Often referred to as The Gulf or the Arabian Gulf. .
Part 2 ( Administration Report of the Muscat Political Agency An office of the British Government and, earlier, of the East India Company. 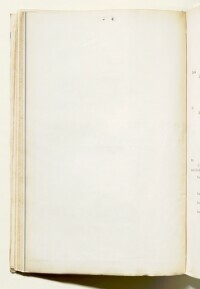 for the year 1885-86 ), submitted by Lieutenant-Colonel Edward Mockler, Her Britannic Majesty’s Political Agent A mid-ranking political representative (equivalent to a Consul) from the diplomatic corps of the Government of India or one of its subordinate provincial governments, in charge of a Political Agency. and Consul at Muscat, dated 28 June 1886 (folios 55-58), containing a summary of affairs at Muscat, and an additional short report on the seizure of slave traders in Muscat waters during the course of the year. Appendix A is a set of notes written on a tour through Oman and El-Dhahireh [Adh-Dhahirah] in December 1885 by Miles. 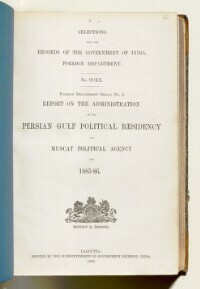 Part 3 ( Report on Trade for the Persian Gulf Historically used by the British to refer to the sea area between the Arabian Peninsula and Iran. Often referred to as The Gulf or the Arabian Gulf. for 1885 ), written by Miles, dated 17 June 1886 (folios 59-92), comprising a short summary of the year’s trade, with notes on: exports (cereals, opium and tobacco); imports (Manchester goods, copper, sugar, naphtha and asbestos); shipping; exchange; the pearl trade. Appendix A comprises tabulated data on import, exports and revenue, in the Gulf ports of Bushire, Bandar-e Lengeh, Bandar-e ʻAbbās, Bahrain and the Arab (Oman) coast. An index to the trade tables can be found at folio 60. 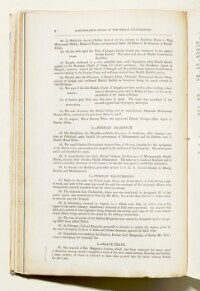 [at Muscat]), by Mockler (folios 92-102), comprising a short summary of the year’s trade at Muscat, and also containing tabulated data on imports and exports at Muscat (listed by commodity), and the nationality and average tonnage of vessels visiting Muscat. Appendix A that follows the report is a note on the weights and measures used in the pearl trade of the Persian Gulf Historically used by the British to refer to the sea area between the Arabian Peninsula and Iran. Often referred to as The Gulf or the Arabian Gulf. , written by Mockler. Foliation: There is a foliation sequence, which is circled in pencil, in the top right corner of the recto The front of a sheet of paper or leaf, often abbreviated to 'r'. of each folio. It begins on the first folio, on number 45, and ends on the last folio, on number 102.